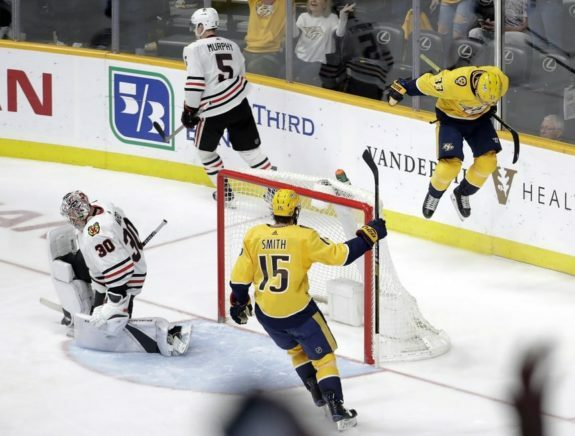 NASHVILLE — Viktor Arvidsson scored the go-ahead goal at 3:33 of the third period, and the Nashville Predators won their second straight Central Division title by rallying from an 0-2 deficit to beat the Chicago Blackhawks 5-2 Saturday night. Brendan Perlini and Drake Caggiula each scored for Chicago, which lost three of its final five. Fabbro, who joined the Predators last week after wrapping up his junior year at Boston University, pulled the Predators to 1-0 with the first goal of his career at 9:07 of the second. Fabbro’s wrister from the left circle went over Ward’s glove. Then Ward made another big save, coming out to stop a partial breakaway by Arvidsson 90 seconds later. Nashville put it away with three goals in the third. Bonino’s goal came inside the final minute with the celebration already well under way.